Caen suffered significant damage during World War II, but it still offers both historic and modern sights of interest and a good hotel, restaurant and transport base for visits to Normandy. Caen is known historically as the base of Duke William (William the Conqueror) in the 11th century. The Château which stands above the city was begun by William the Conqueror in about 1060, with later additions over the centuries. Today you can walk on the ramparts for great views of the city, and visit the Normandy Museum and the Fine Arts Museum, both housed there. William had an "irregular" marriage to his cousin, Mathilda of Flanders. Wanting to reconcile with the Church, William built the Men's Abbey (Abbaye-aux-Hommes) and the Women's Abbey (Abbaye-aux-Dames) in Caen. Both historic structures offer guided tours. Modern Caen's greatest attraction is Le Mémorial de Caen Museum, also known as the Centre for History and Peace. Focused on the history of the 20th century, the Museum includes exhibitions that focus on the world pre-1945 and post-1945 to the present day. Caen suffered extensive damage during World War II, though a few historic buildings survived or have been restored. Caen is home to several historic churches, including Saint-Pierre (13th to 16th centuries, located near the Office de Tourisme and the Château), and Saint-Sauveur (Also called Notre-Dame de Froiderue), on Rue St-Pierre. Rue St-Pierre itself is a lovely place to walk. Largely a pedestrian street, it features some old half-timbered houses, an assortment of shops and restaurants, and some historic churches. The Marina (Port de Plaisance) is also a pleasant place to walk and has a variety of restaurants and hotels. The Tourist Office in Caen offers a Caen Pass Tourisme that provides small reductions in some entrance fees as well as some discounts for restaurants and other attractions. Caen is the center of the Basse-Normandie (lower Normandy) region of France, and in the département of Calvados (yes that Calvados—the apple brandy—comes from nearby). Caen is also a good base for day trips to the Normandy D-Day sites, Bayeux, Honfleur, and Mont Saint-Michel. 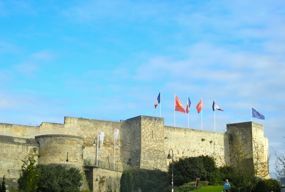 Above, flags fly above the Château de Caen. 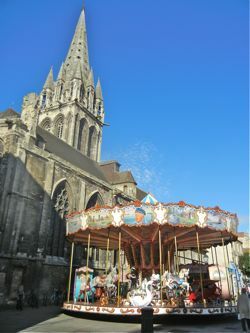 Below, Notre-Dame de Froiderue (started in the 14th century) shares space with a Carousel.